Hello. As far as the butter goes… is it salted or unsalted? Either! I usually have salted on hand so that’s what I use. Best pie ever!! I made the crust without the food processor, I just put the sticks of butter in the freezer for 15min and then cut it into the flour. It was easy and fast and super delicious!!!! Love this recipe my new go to!! 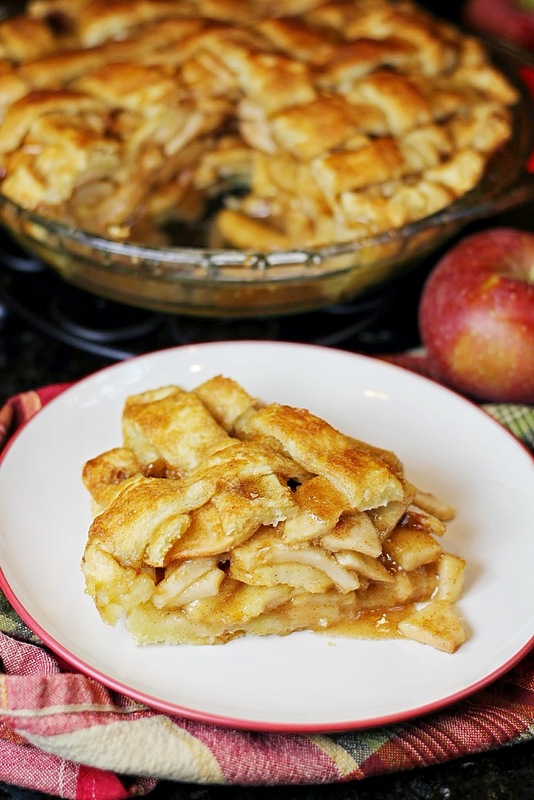 This is the easiest and the BEST apple pie EVER!! I’ve made it several times (used plain pie crust shells) and my family loves it every time. Thank you!!! Awesome, Cheryl!! Thanks for your comment! I got so many compliments on this pie today! It really was the best apple pie ever!! My 13 year old son and I made it together and he wants to make it for Christmas too!! Yay!! So glad you’re making it a part of your family’s holiday traditions! How long would you normally let this pie cool before serving? I’m planning to make this for Christmas dessert and am not sure if I should make it the night before or the day of! I cut into mine once it has cooled for at least 2 hours. So, you could certainly make it the morning of and serve it for dinner. Hope that helps! I understand! I learned how to do a lattice by a Google search and YouTube tutorial 🙂 I don’t have one personally but a quick Google search should provide that for you! Hi Audrey, Iam planning to make mini pies. Is it possible to make mini pies with the same recipes ? What tempeture should I use and the same cooking time ? What a neat idea! I haven’t tried it personally so I’m not exactly sure how to advise you. My guess is you can keep the temperatures the same but reduce the amount of time the pies bake after you reduce the heat down from 425. I would keep an eye on them and poke the apples with a fork to check for doneness every once in a while. Again, just a guess. You don’t really have to worry about overbaking other than the crust getting too brown, so I think there’s quite a bit of wiggle room. When in doubt, cook it longer and cover the crust loosely with foil so it doesn’t burn. I hope that helps! I’m not sure what you mean by crumble. Do you have a recipe for that which you’re following separately? You can still make the crust without a food processor if you’d like! So you have a pastry blender to help cut in the butter? You can even use 2 knives but it’ll take longer. Sorry I was in a rush when I typed it that I didn’t explain myself properly. I meant that I decided to do an apple crumble instead of an apple pie. Anyways I’ve made it now and it seems okay. This came out awesome- I did try to use gluten free flour and the taste was different than a standard pie- but the overall outcome was great! The caramel sauce is killer. Awesome! What kind of gf flour did you use? I have yet to try to make it gluten free but I need to soon! The instructions just say “prepared pie crust”. Do you pre-bake your crust? If so, how do you recommend doing it? No not prebaked, that was really a reference to just having already made the pie crust if you’re making it. Otherwise store bought is fine and you don’t need to prebake that either! Thank you so much! Looking forward to making this for a friend’s birthday this weekend! I have a problem with watery apple mixture. How can I guarantee a beautiful apple mixture? I have never made a pie from scratch before, but this recipe was absolutely delicious. I have found sautéing the apples after making the butter/sugar sauce insures that the apples are tender. I presonally don’t care for crispy apples in my pie. Using dark brown sugar ensures a nice caramel flavor. I also add a splash of Calvados (apple liquor) in the skillet as well. Hello! I wanted to know if I can make this pie, a day ahead? Or the night before a party? Will it hold up well or will it get soggy? If I do make the night before, should I store it in the fridge or on the counter? You can definitely make it the night before or the day before! That’s actually what I usually do and it turns out great. You can keep it on the counter if you’re eating it in the next day or so. Hi, I’m new at baking. What is the measurement of that? I’m excited to try this out. I mean the 1 stick butter. how do you measure that? Hello, AudreyApron, could you please tell me what size is the pie plate that you use? Mine is just the standard size I believe. However, I’ve made it in many different sizes and it’s always been fine! Can I do a regular top crust instead of lattice? Ty! Is it possible to freeze this pie unbaked? 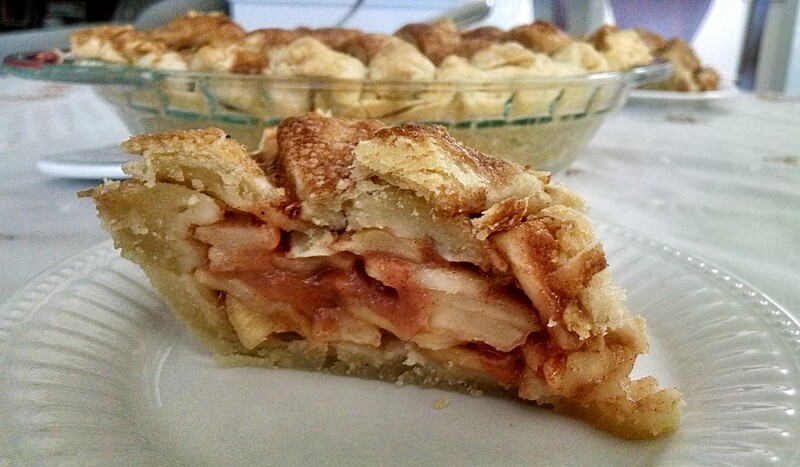 I often do that with apple pies but not sure what the consistency of the cooked apples would be after being frozen. 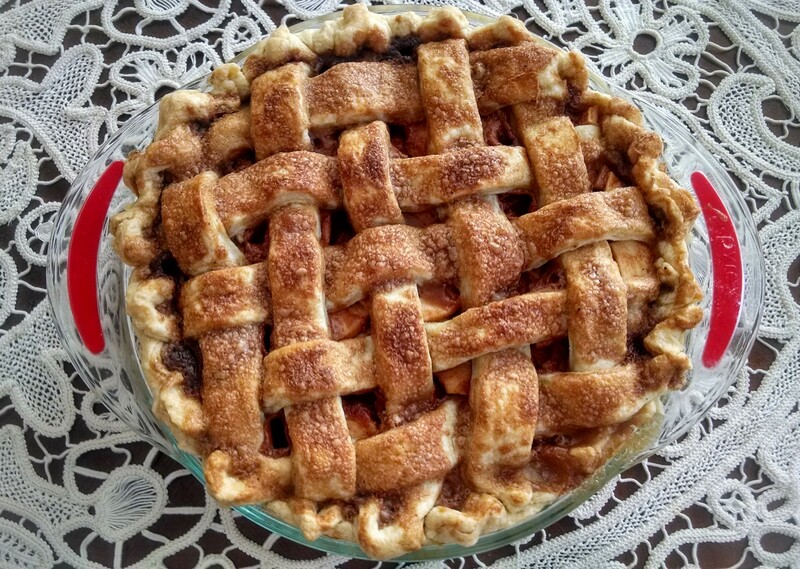 A perfect apple pie! Thank you so much. Hi there love this apple pie it’s beyond delicious. However, I always end up having to bake this for much longer then the recipe calls for. What am I doing wrong? Hmm I’m not sure, it could just be your oven. I’m glad you’ve figured out a way to make it perfectly though! 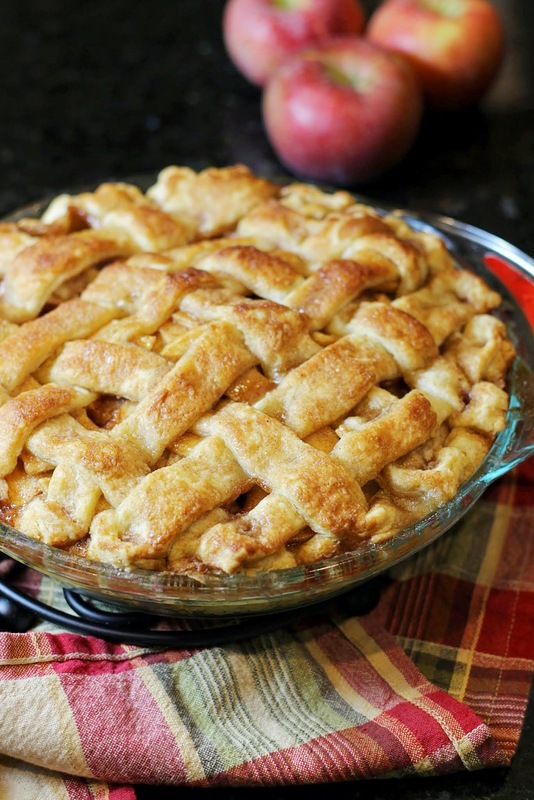 I am making this pie today! Should I use light or dark brown sugar? And for the white sugar, is it powdered or granulated? Either light or dark will work. I usually have light on hand so that’s what I typically use. And definitely granulated sugar! 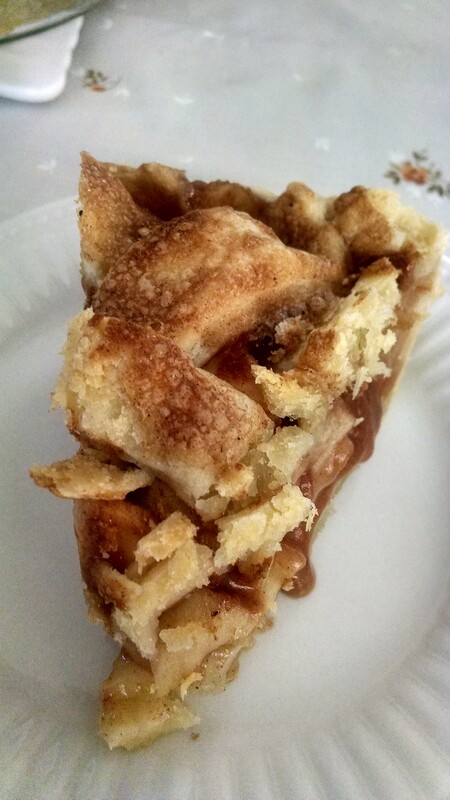 I make this pie every year… it’s one of the best recipes I have found! Thank you for sharing it! However, I often have trouble getting the caramel mixture right. It seems that it the flour seizes up and the flour/sugar forms a mixture that separates from the butter. Is it possible I have the temperature too hot when I stir in the flour? I’m unsure of how to problem solve it because I don’t make this kind of recipe often. But I made it just now and the same thing happened so I am going to throw it out and start over. It’s not a nice smooth sauce – it’s clumpy and separated from the butter. Any ideas? I know it’s a user error on my part, not your wonderful recipe!! Hi Lucy! I’m so glad you love this recipe! I have actually had that happen to me before too and I do think it is a temperature issue. When it happened to me, the butter did seem to separate but the rest of the mixture was smooth. I actually took a risk once and proceeded with the recipe and somehow as it baked it seemed to fix itself and the end result was completely normal! So, I’m not sure that would happen with your situation because it’s lumpy, but something to consider. My best advice is to whisk it constantly and err on the side of lower temperature (medium heat or maybe even a touch lower if your stove is hard to regulate). I hope your second attempt was successful! SHould I put the sauce on the unbaked pie before or after I freeze it? I put it on before freezing.